There’s a reason we turn to our favorite fancy restaurant or the neighborhood pizza guy instead of making our movie night meal at home. 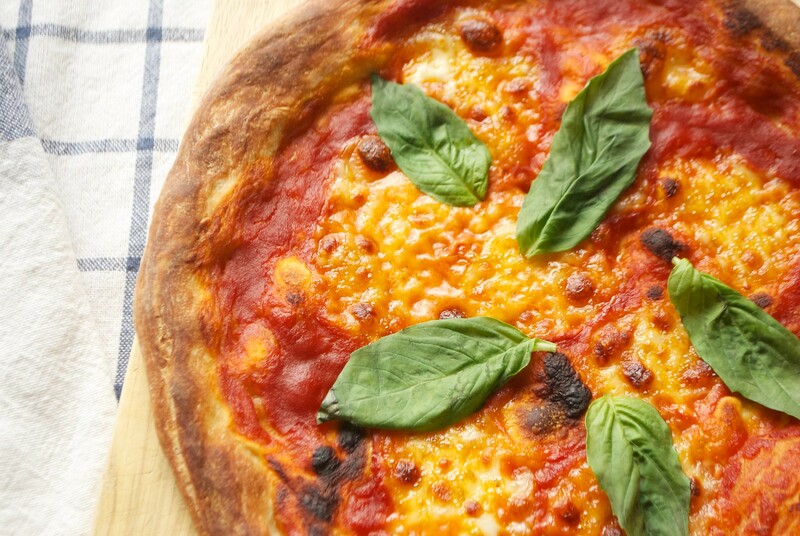 Pizza is extremely hard to make right. The pizza pursuit. I’ve been on the trail for years now, baking up pies with too much sauce, too little dough, too much cheese, too little cheese, and everything in-between. 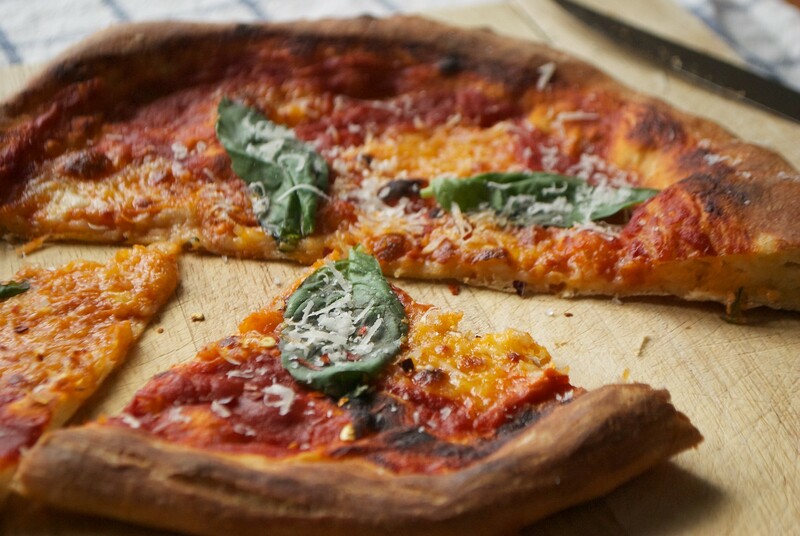 Pizzas with burned cheese and soggy bottoms. Pizza that had the right amount of crackle and chew, but didn’t really taste like, well, pizza. I’ve played around with water-to-flour ratios, cooked up various sauces, blended san marzano tomatoes to a pulp, bought weird cheeses, and turned up my oven so hot that it set off the smoke detector the minute I slid my first pie in. But in all this time, I had missed a couple of very crucial steps. 1. I didn’t have a kitchen scale. And 2. I never changed up my flour. After watching Jim Lahey so successfully use all-purpose in his no-knead pizza recipe, I figured I could get great pizza out of my oven if only I could get the heat up high enough and perfected my method. And water always has the same density at sea level, and Gosh, does hydration even matter that much? Oh, how I was wrong about those things. Unlike many of the things you can cook or bake in your kitchen, pizza relies as heavily on equipment as it does on method. You’re going to need quite a few things that you probably don’t already have at home. And without those things, you’re going to have a very hard time turning out a pizza that looks like the pros’. 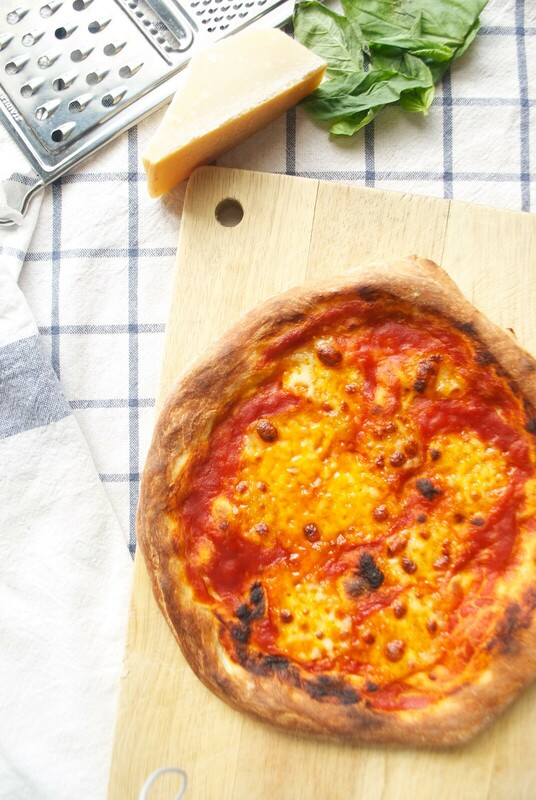 You can substitute here and there, and you can seek out the best, most descriptive recipes you can find and try to eyeball it… But the truth about making pizza at home is this… The more of the right equipment you have, the greater your chances of success. For me it was as simple as using a kitchen scale and some bread flour. Of course I haven’t exhausted the pizza possibilities. There are still a million variations I haven’t explored. Next on my list: switching out my flour for the 00 variety, and acquiring a proper pizza stone. But until then, I’m perfectly happy with these pies. 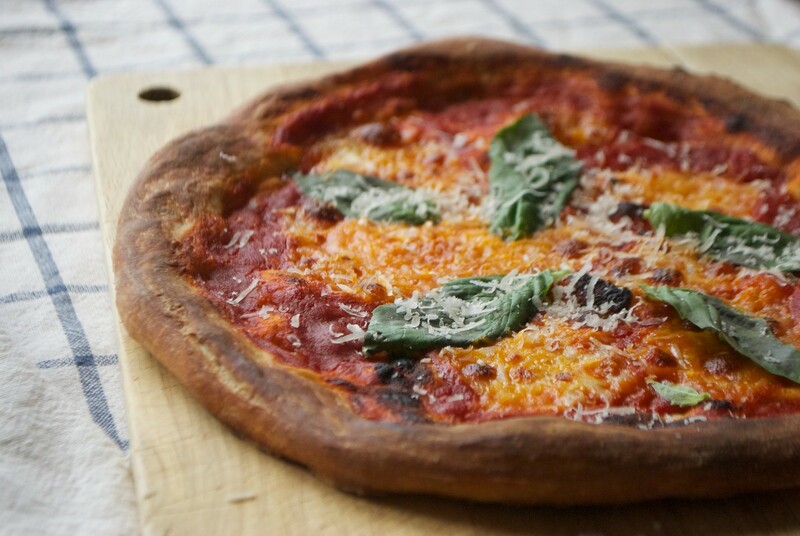 In fact, this margherita pie is the best yet to come out of my home oven… And it’s one I’ll make again and again. 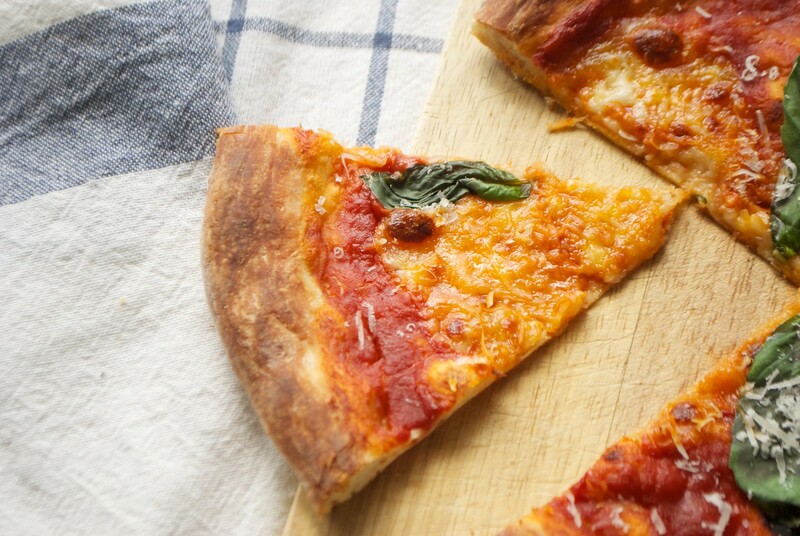 A restaurant-style thin crust pizza with crispy crust, sauce, and fresh mozzarella. An almost Neapolitan-style pie. Stir together flour, sugar, salt, and yeast until combined. Slowly add in the water, stirring continuously. Add the oil. Mix until the dough is just combined and no dry flour is left. Let the dough stand 10 minutes. Knead the dough briefly on a lightly oiled countertop until smooth, 1-2 minutes. Shape the dough into a ball, place in a lightly oiled bowl, and cover with plastic wrap. Refrigerate for at least 24 hours and up to 3 days. One hour before baking the pizza, adjust your oven rack. For ovens with the broiler at the top of the oven, move the rack to the second highest position, 5 inches below the broiler (and no closer). For ovens with a broiler drawer, adjust the rack to the second lowest position and bake the pizza in the main oven compartment. Place a pizza stone or an upside-down baking sheet on you oven rack. Preheat the oven to 500 degrees. 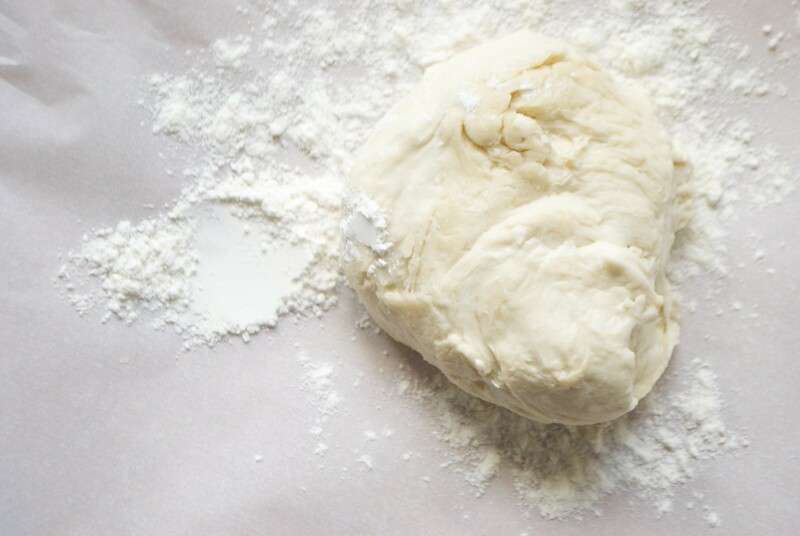 Remove dough from the refrigerator and divide it into 4 equal pieces. Shape each piece of dough into a ball. Place on a lightly oiled baking sheet, spacing balls 3 inches apart. Cover loosely with plastic wrap and let rest at room temperature for 1 hour. Place one ball of dough on a generously floured surface. Dust the top lightly with flour. Using your fingertips to work the dough, stretch it out into an 8-inch circle, leaving slightly thicker and un-flattened outer edge. 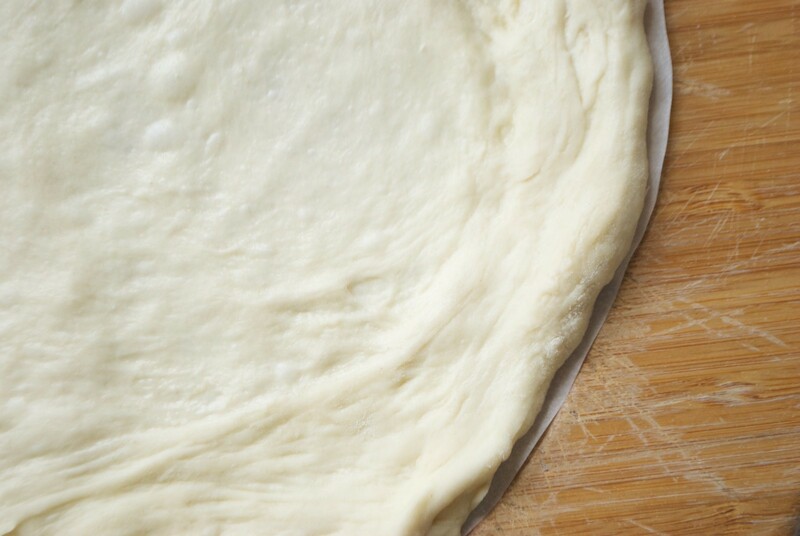 Transfer to a well-floured pizza peel, then continue to work the dough until it is a 10-inch circle. 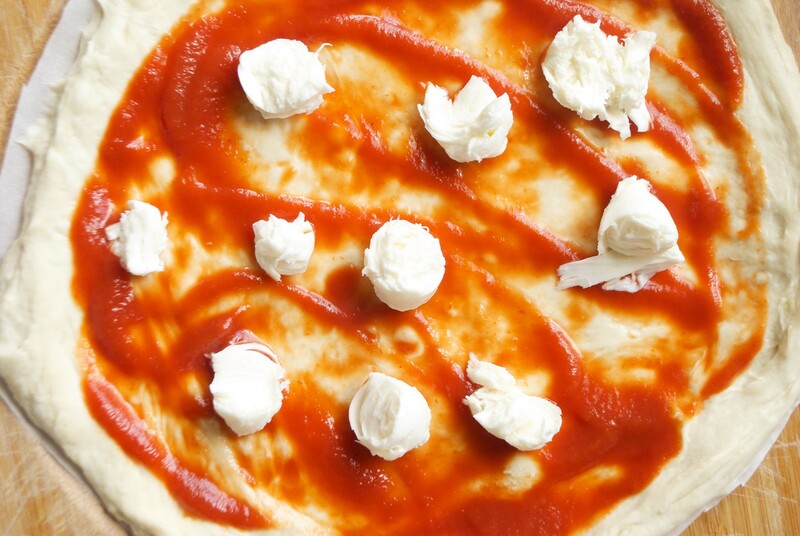 Spread about 1/4 cup tomato sauce evenly over the pizza. 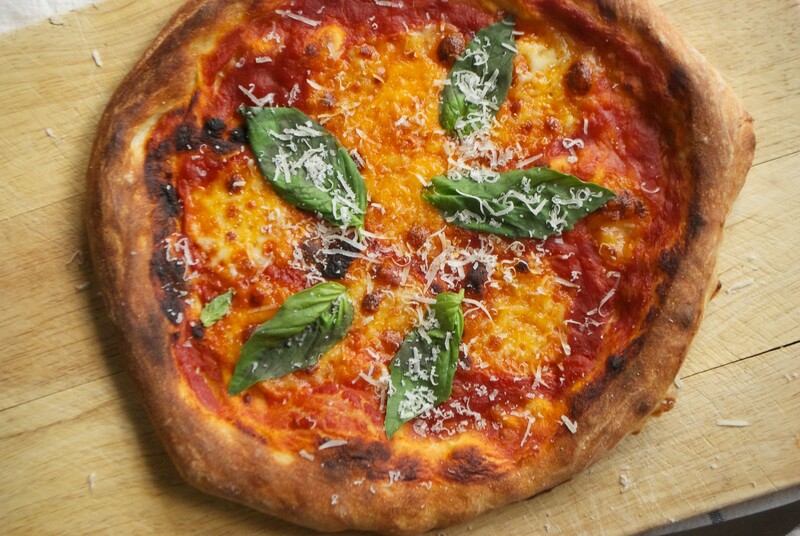 Top each pizza with 2 ounces or less of torn fresh mozzarella. 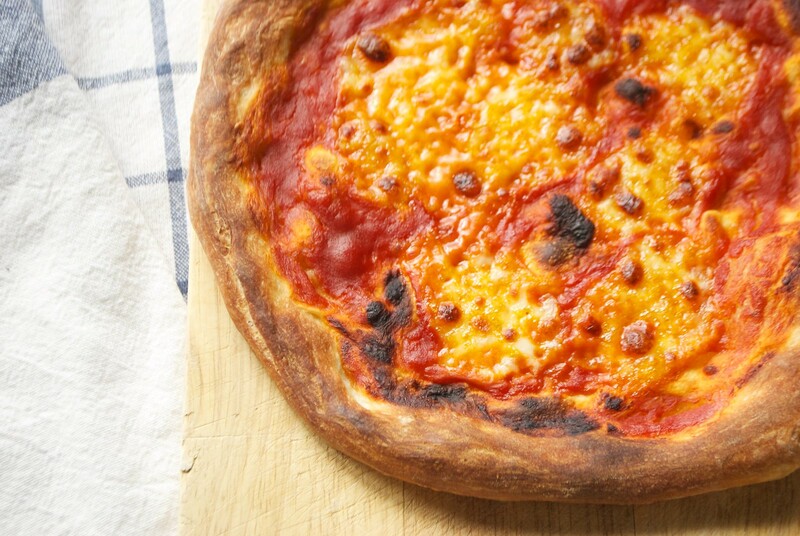 Slide the pizza carefully onto the pizza stone and bake until the crust is well browned, cheese is bubbly, and the pizza is almost done, 8-10 minutes. 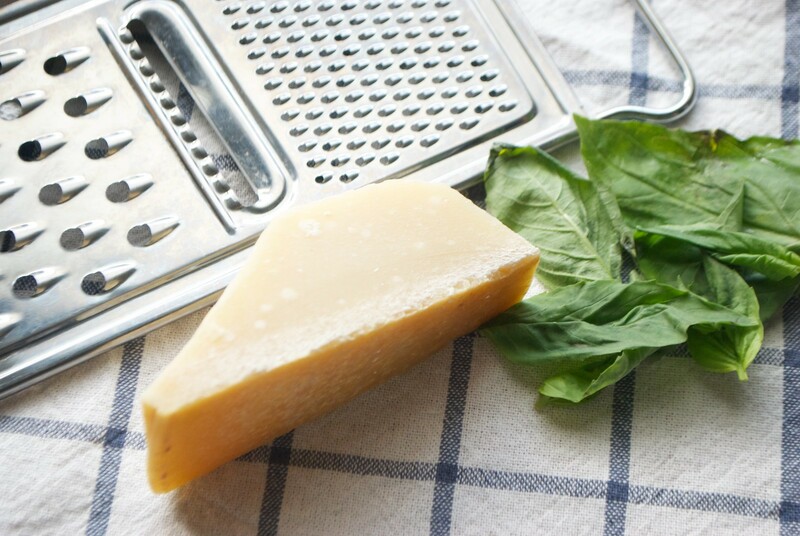 Remove the pizza from the oven, top lightly with up to 1/2 ounce grated parmesan, and 5-6 leaves of fresh basil. Press the basil gently into the pie. Slide the pizza back into the oven for 1-2 minutes until the crust is well browned, cheese is beginning to brown, and basil is wilted. Remove the pizza from the oven and allow to cool for 5 minutes before slicing and serving. Repeat for the three remaining pizzas. If you don’t have a pizza peel, you can use an upside-down baking sheet and simple make sure the bottom of your pizza is well floured. 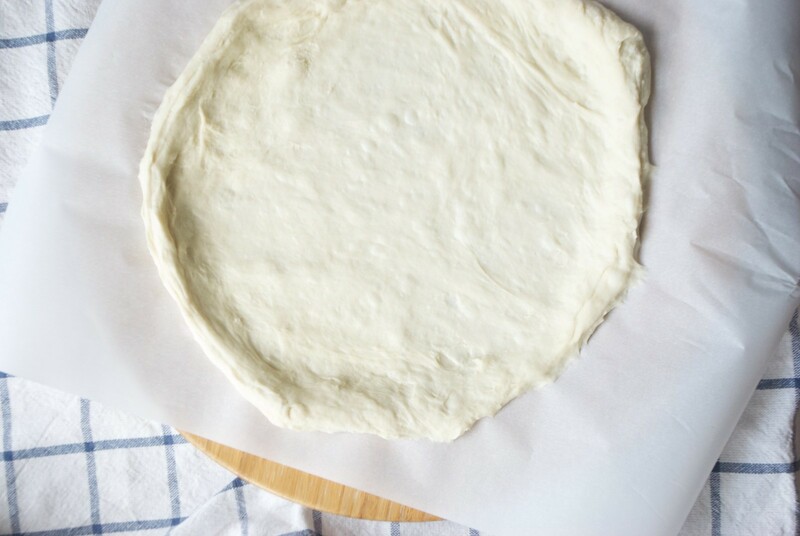 If you notice any issues with your pizza sticking to your makeshift “peel,” try stretching it out on a piece of parchment paper. 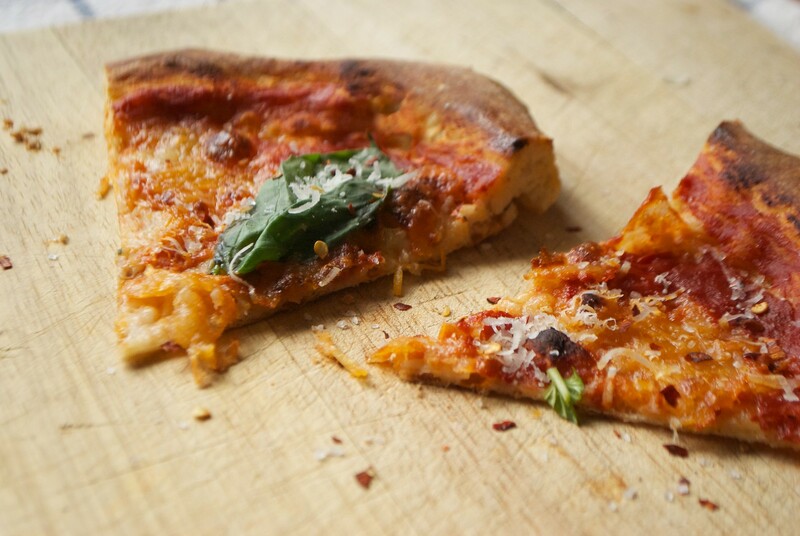 Be sure to trim the parchment to fit your pizza (no more than 1/4 inch of parchment sticking out from under the pizza on all sides) before sliding your pizza into the oven— otherwise the excess parchment can be a fire hazard! Adapted from Serious Eats & Cook’s Illustrated. Amanda, sorry to hear about your pizza predicament! I would go crazy if I didn’t have my favorites available to me. I hope this recipe works for you! The bread flour works surprisingly well. And I hardly ever use a scale when baking, though this is one of the few recipes that really needs it!